The excerpts that follow are from the workshop held at the Center in Temecula, CA, in February 2002. 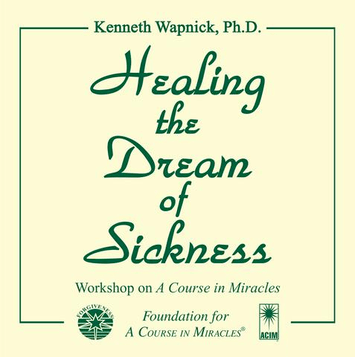 Sickness and the body are viewed in their metaphysical context, in which their purpose is defined as the fulfillment of the ego's wish to keep separation real in our minds while projecting responsibility for our condition. Sickness, regardless of its form, is seen as a shadow of our unconscious belief in sin and guilt. The body and the world, thus, are the source of neither sickness nor healing. Consequently, healing rests in our being able to look with Jesus at our decision to push love away and then blame something outside ourselves for our plight. Our joining with Jesus in this way—without judgment—removes the cause of all sickness.